Minnesota simply dominated Minnesota State en route to a sweep, with a 4-1 win and a 7-0 win in their home-and-home series. The Gophers are still getting important secondary scoring from players like Dani Cameranesi, Kate Schipper, Sarah Davis, and Kelly Terry, who had a hat trick on Saturday. But their top line is also rolling again, and they’re getting big contributions from top defenders Rachel Ramsey and Milica McMillen. Overall, Minnesota is clicking right now, but it’ll be interesting to see how they fare against a team that can match them offensively. North Dakota also had a very good weekend, beating Bemidji State 6-2 and 5-1. Despite the absence of leading scorers Michelle Karvinen and Susanna Tapani, UND didn’t have much trouble getting things going offensively. Meghan Dufault, who I thought had a bit of a quiet start to the season, powered the offense on Friday night with a hat trick. Depth players like Amy Menke, Kayla Berg, and Tori Williams also stepped up on Saturday. The fact that production didn’t completely dry up with the loss of two big players is a really good sign for North Dakota. Clarkson started off the weekend with a 1-1 tie against Brown, but bounced back to defeat a tough Yale squad, 7-0. The Golden Knights have had issues executing in recent weeks, despite controlling play for long stretches and piling up chances. 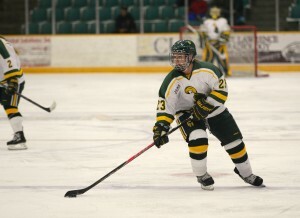 Instead of getting frustrated and allowing it to affect them negatively, however, Clarkson responded well against Yale, scoring seven times in a resounding win. They’re doing a lot of things well and just need to make sure they take advantage of their opportunities going forward. Wisconsin earned a big sweep over Ohio State, winning 4-1 and 3-2. The Buckeyes got on the board first in both games, but the Badgers’ offense was able to answer them all weekend. Blayre Turnbull continued her impressive breakout season, scoring two of Wisconsin’s three goals on Sunday and totaling four points on the weekend. The Badgers were able to shut down Ohio State’s power play, going 7-for-7 on the penalty kill, and that helped them to really limit what the Buckeyes could do. Cornell squeaked by Princeton on Saturday, beating the Tigers 5-4 after jumping out to a 5-0 lead in the first. They then went on to tie Quinnipiac, 1-1, on Saturday. The Big Red are finding ways to score in bunches, but they’ve had trouble keeping the puck out of their own net, and that’s becoming concerning. Cornell did a better job against the Bobcats, only giving up the one goal, but Quinnipiac still had plenty of chances. The Big Red need to spend less time in their own end, and also need goaltender Lauren Slebodnick to be a little better in net. Harvard suffered a surprising 2-1 loss to Rensselaer on Friday. The Crimson controlled play for the better part of the game, outshooting the Engineers 24-7 in the second and third periods, but they only managed to score once, and gave up the game-winner halfway through the final frame. Harvard did bounce back from that to earn a 3-0 win over Union on Saturday. I think we’re seeing now how much their lack of proven scorers is going to affect them. A few different players have been chipping in so far, but the Crimson are going to need at least one or two to distinguish themselves as dependable scorers. Boston University defeated New Hampshire 3-1 and Vermont 6-0 this weekend and are now 6-1-1 on the season. They’re riding a four-game win streak and though I still have some doubts about them, their play has definitely improved from their first few games. The Terriers’ top players are coming through and producing regularly now, and they showed some scoring ability throughout their whole line-up in that win over Vermont. However, they still have to prove that they’ll have that kind of scoring depth on a consistent basis. And though they did a good job against the Catamounts’ stars, the Terriers’ defense still has to prove it can handle stronger offensive teams. Quinnipiac had a great weekend, defeating Colgate 6-0 and then tying Cornell 1-1. Although they couldn’t get the win, the Bobcats played extremely well against the Big Red. They had control of the puck for most of the game and did a really good job of limiting Cornell’s opportunities off the rush, which is where the Big Red have had a lot of success this year. Kelly Babstock has been playing out of this world, and their entire top-six has been very proficient this year. It’s a little worrying that Quinnipiac’s goal-scoring has dropped off when they’ve played top teams, but they turned in a very good defensive performance here against a quality team and deserve a lot of credit for that. Vermont will attempt to “Pack the Gut” and break the Hockey East attendance record of 1,498 this Friday night when they host Boston College. The Catamounts will be partnering with Meals on Wheels in Burlington for the event, and admission to the game is only $2. A piece on sisters Carly and Cayley Mercer from the New York Hockey Journal, who play at Clarkson University together and who have both been making big contributions to the squad this year. Here’s a story on Minnesota’s top line of Maryanne Menefee, Rachael Bona, and Hannah Brandt, and just how important they are to the team’s success. A piece from the New England Hockey Journal on Northeastern’s fifth-year senior forward Kelly Wallace, who is trying to help lead the Huskies to an NCAA Tournament berth in her final year. A big congratulations to Meghan Duggan, who was named captain of the U.S. Women’s National Team for the remainder of the Bring on the World Tour. Duggan also wrote a blog post for espnW last week following the USOC’s “100 Days to Sochi” event in New York, and will be updating during this week’s Four Nations Cup. Here’s an inside look at the North Dakota women’s hockey team, from redshirt freshman goaltender Amanda Koep. From GopherSports.com, a little Q&A with senior forward and assistant captain Sarah Davis, who scored her 100th career point this past weekend against Minnesota State. Minnesota’s win streak has now reached 59 games. Yes, really. This week’s USAHockey.com feature, on highly-skilled forward Brianna Decker, who’s trying to make the Olympic team for the first time in her career. A nice piece from NHL.com on Geraldine Heaney, who will be inducted into the Hockey Hall of Fame this year, written by former teammate Cassie Campbell-Pascall. Canadian National Team defenseman Tessa Bonhomme played her 100th international game last night in the Four Nations Cup against Finland. 1. Julie Friend, Junior, Goaltender, St. Cloud State: She made 52 stops on Friday night to help the Huskies upset Minnesota-Duluth and win 4-1; 30 of those saves came in the third period, which is just mind-numbing. 2. Kelly Terry, Senior, Forward, Minnesota: She scored a hat trick on Sunday and also added four assists this weekend, leading the Gophers to a sweep over Minnesota State. 3. Aubree Moore, Senior, Goaltender, Brown: She made 53 saves against a potent Clarkson offense to help lead the Bears to a tie against a very strong team. Kelly Babstock’s move coming off the boards to get to the front of the net and put it away.